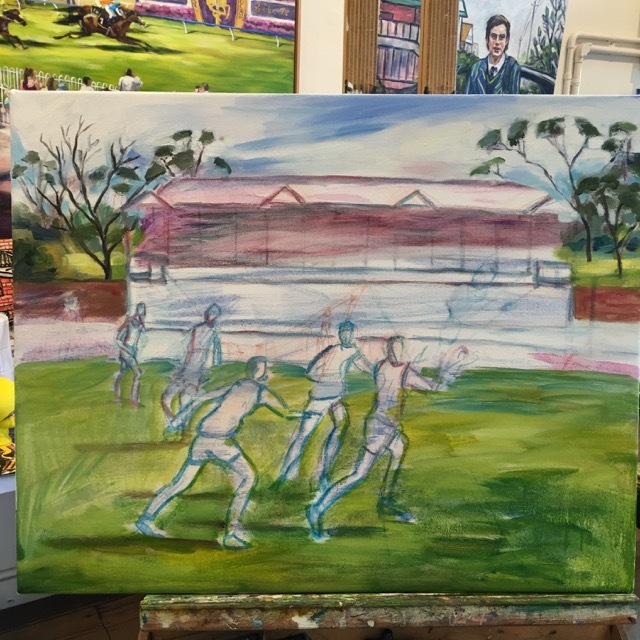 I've put up some images of this painting of the stand at Punt Road. And some of the quick sketches I did at the ground. The Tigers were training (well....they appeared to be) on this particular day so I could only get a distant view from Punt Rd. Walking around the ground I discovered the museum was open. As it turned out, I had a fabulous tour with the curator, Roland, I think his name was, who undoubtedly is an expert in all things Yellow and Black. His own personal collections, many of which are in the museum, have been accumulated over his lifetime. Team photos, footy trinkets from cereal packets, swap cards and the rest, are just some of the items he has bought at Camberwell market or had donated to him. Punt Road Oval is beautifully located with a backdrop of gum trees and open space in the area behind the stand. The stand has a curved footprint and the upper deck really embraces the shape of the oval. At the Punt Road end of the stand, The Jack Dyer Stand, an old sign remains intact. It reads clearly Vickers Gin over a space that must have been the bar. With crowds that on occasions exceeded 40,000 people in the 1940's, one can only imagine what this area would have been like for a spectator. In fact, it is probably difficult to imagine in these relatively affluent times. Without modern sanitation and facilities to accomodate so many, these spaces must surely have had an atmosphere, all of their own. For the painting I had a look at some old photos. At some stage there was clearly a traditionally white picket fence, possibly up until the 1950's. 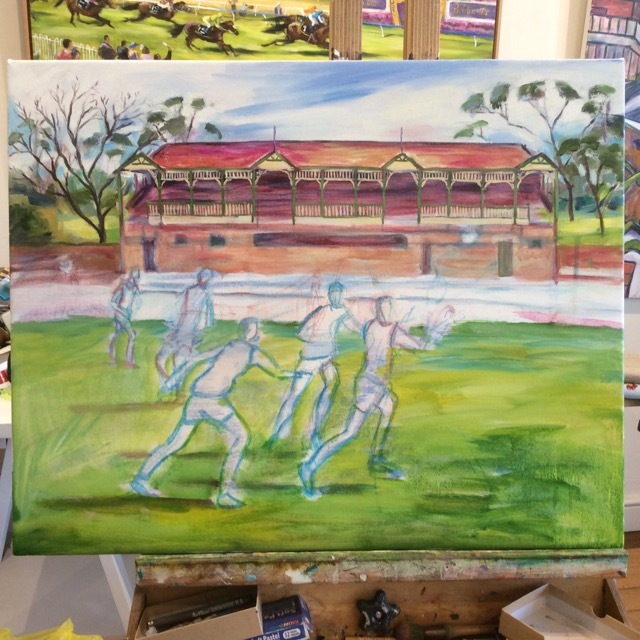 The painting is not of one year in particular, rather a reimagining of the ground as it has been. I came across a player I hadn't heard of Billy Barrot, prominent it seems in the mid to late 1960's. He was a dual premiership player and the 1965 Best and Fairest player of the year. He was also known as Bustling Billy for the way he could work through the pack on the field. The genesis of players names is an interesting quirk in the establishment of personalities in the game of Australian Rules football. I scouted through some old You Tube footage of him playing at the MCG. Even though I have no living memory of Billy, something about it all sounded familiar, in both sound and vision, that I wonder if it was the backing lullaby of my infancy. 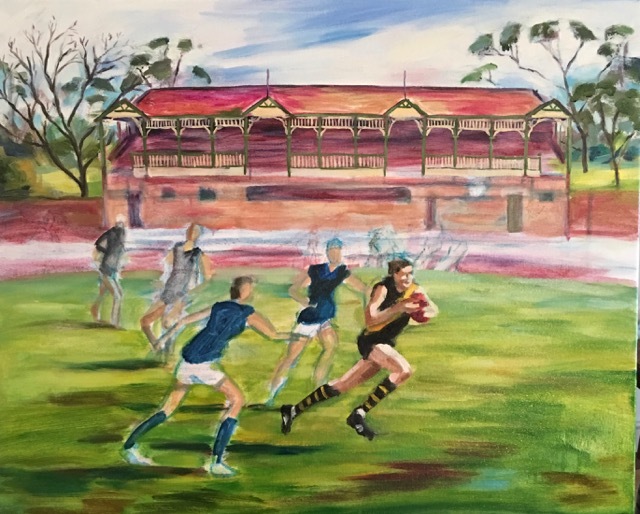 The Jack Dyer stand is magnificent in its restored glory, particularly in its' yellow and black trimmings on the fretwork. Looking at bits of missed paint work and the old pictures I came across it seems the fretwork in the 1960's would have been a more traditional Brunswick or bottle Green and Cream combination. I plan to go back to Punt Road on a day that I can hopefully access the ground and have another look around.